After nearly a month of broadcast, it's time to say goodbye to the cast of The Way We Were as it aired its last episode tonight. Leading lady Tiffany Tang Yan certainly hasn't stayed idle as she attended an event on the same night to reveal her next project. Wuming Zhentan aka Nameless Detective 无名侦探 is a drama helmed by actor Wu Xiu Bo who is a producer and the leading man. The last drama that Wu Xiu Bo headlined and produced was Advisors Alliance, which most of us can agree was a stellar production. 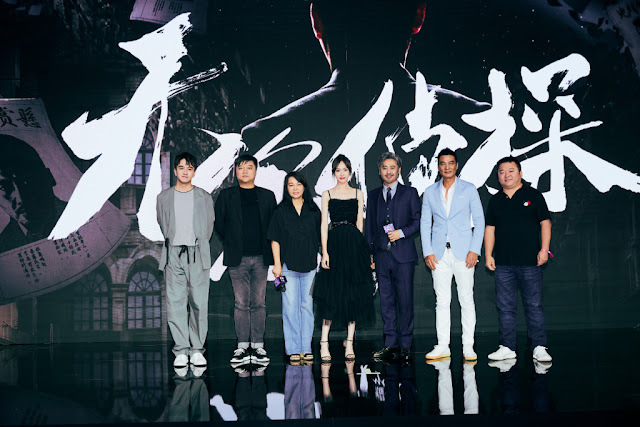 Not much is known about this new drama except for its solid cast which also includes veteran actor Simon Yam and Zhai Tianlin who also acted in Advisors Alliance. The role of the leading lady was a mystery up until now when Tang Yan was finally introduced. Wu Xiu Bo shares that Tang Yan is an artist that he has always wanted to work with and it looks like their pairing was meant to be given that the two have indeed ended up as co-stars even after rumors of Tang Yan taking the lead role in City of Desire didn't pan out. Great news! She looks so beautiful in these pictures.